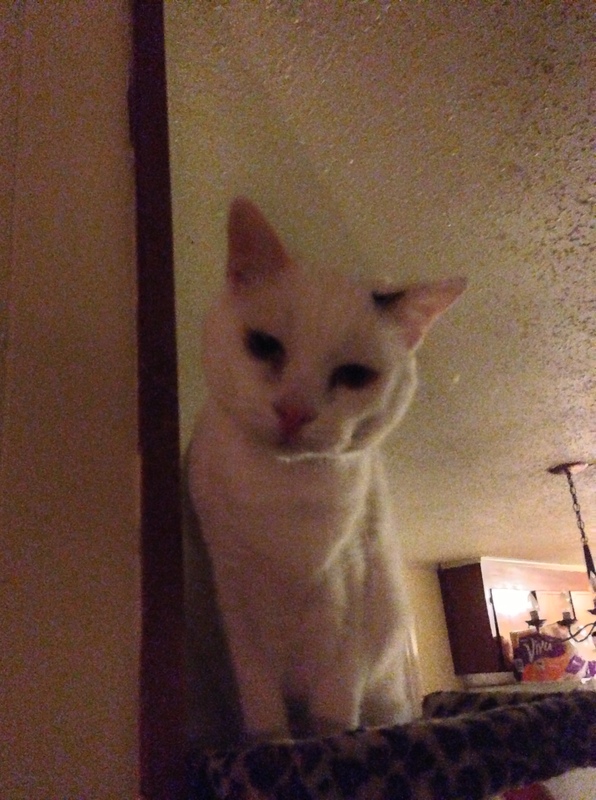 When Jen FINALLY got herself up this morning, she was greeted by a none-too-happy Malachi, who gave her the what for. Seems to be happening alot lately. Here’s Bubba giving her an earful just last night. And if that’s not enough, even the neighbor cats have stepped up to keep an eye on her. 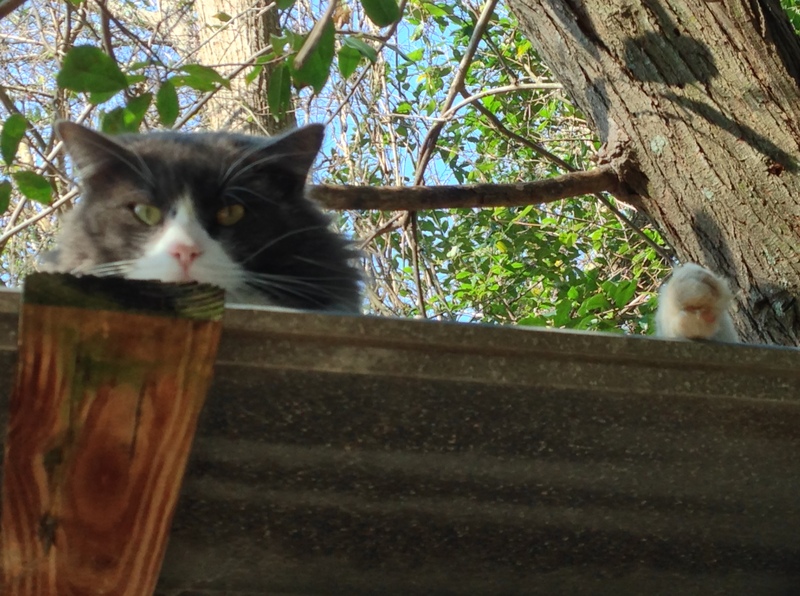 Here’s Puddles, the neighbor cat, spying on her from atop the storage building. I got my eyes on you lady. So take this as a warning Jen, you better start walking the line! Hello Nia! Have a wonderful day as well! Geez laying down the law so early. What a crew! Ya gotta do what ya gotta do! For the neighbors to be getting involved she must have been REALLY BAD…or…….word spread….FAST! it’s a cat thing…. I guess…. No slackers allowed around these parts. woo woo! I know, and you guys don’t play around either! woo woo! Yeah, she better watch out! Puddles is a force to be reckoned with! Hi – Isaiah here – it is really a difficult job keeping our humans in line. I have to “speak up” daily to make sure she behaves and gives me attention when I want it, not when she feels like it. Keep up to good job boys and girls. You have to keep her in line. MOL! A cat’s work is never done! There’s nothing like getting the “stink-eye” from a cat! She’s maybe some kind of treat-goddess and all the complaints are just the normal way of getting the treat-godesses attention. Sometimes we have to resort to “THE LOOK” to get stuff we want from our humans…..looks like you’re in for it now Miss Jen!! Jen, is there some bad karma floating around? Those bossy boots are giving you a hard time! You can never slack up on your training of humans! We have had the occasional neighborhood cat come by and try to torture our house cats, but us dogs go to bat for the kitties and get rid of those naughty outdoor cats! maybe that’s why he’s on top of the storage building!! Humans are so hard to train!! We are about back to normal. Jen resumed much of her routine, except we are watching less television. That might not be a bad thing. Oh no….poor Jen! Not only her kitties but also the neighbor cat traines her! BOL! I sure hope she gets her act together! Oh boy, Jen is in trouble now. She’d better shape up and fly right with all those spies around. Wimmen can be very… obstinate can’t they? Poor Jen! Natasha wakes up grumpy and growls at poor little Maxwell. She snaps out of it quickly, but it’s still unsettling. Hmmmmmmm…I suspect some felines have not been getting enuff scritches….purrlease explain again why you, Miss Jen, must go to this work place for so long almost every day?? OMGosh Jen I’m laughing so hard here. I love that picture of Bubba telling you off cause DeDe has a look of ‘I just wanna stay out of it’. Puddles is an adorable name and love the toes hanging over. Puddles has a great look out so best be good, HA! Uh oh…I sure wouldn’t want to face a herd of angry kitties! OH! come on you guys give Jen a break! After all where would you be without here!!! Yes …there’s a thought!! O-M-G – nothing like the animals watching and talking to you – ha! Oh those cheeky fur people! Complain complain complain. If it’s not the quality of the biscuits, it’s having to go out when it’s RAINING. Good grief, is that fair? Well we wouldn’t have to out if you’d provide us with indoor accommodation! Uh oh, might want to call in some backup! Whatever it is , Jen, your days are numbered!! Parents must be kept in order, or they will begin running wild! If it’s food they want, set up an automatic feeder and let them fend for themselves. Be mindful, Puddles looks like an enforcer! 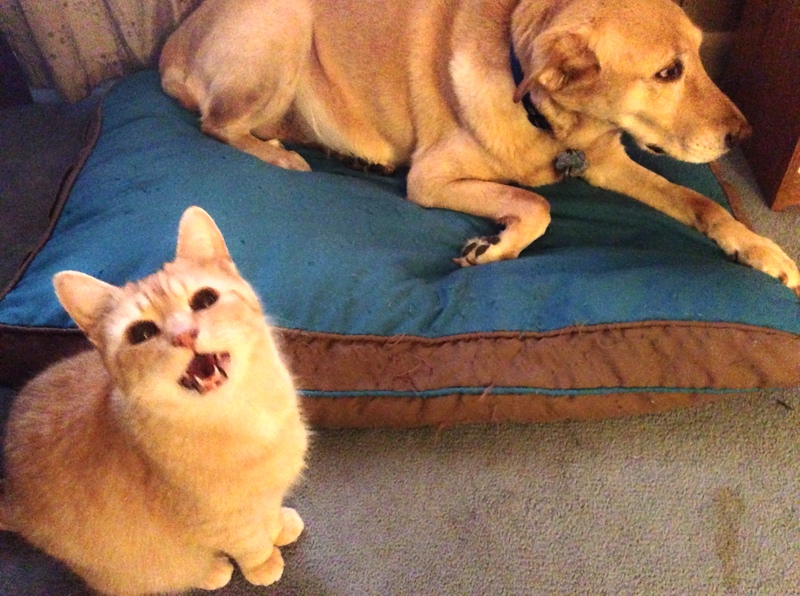 Mine come and tattle on each other too…that is so funny…and the cats do rule in our house. Jen is being very much watched. How cute. Thank you for sharing. Kitty Cats do have the run, it is apparent others need to listen! Good thing she has us to keep her on her toes!